This Eugene Iverd painting was the hidden treasure of the appraisal booth at the Niskayuna Reformed Church’s Antique Show on Friday, January 19th. The show had a wonderful selection of vendors and attendees brought a great variety of antiques for Mark to appraise. Eugene Iverd (1893-1936), born George Melvin Erickson, was a Minnesota artist well-known in the 1920s for his paintings and illustrations. He submitted his first picture to The Saturday Evening Post in 1926 with them publishing his first artwork on the March 13th cover of the same year. During his career, Iverd produced 55 magazine covers and approximately 60 advertisements for clients including Campbell’s Soup Company and Monarch Foods. This beautiful painting, entitled ‘Lighting the Pumpkin,’ was published on the cover of the November 3, 1934 issue of The Saturday Evening Post. The framed painting, measuring approximately 26″ x 18″, wowed onlookers with its beauty. The young girl makes eye contact with the viewer, a bright smile on her face. 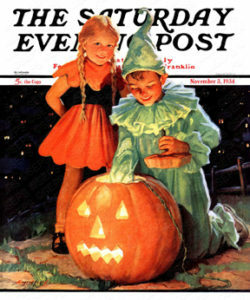 Light spills from the jack-o-lantern as the young boy in costume, his face covered in glee, puts a match into it. Beyond the warm glow, pairs of spooky eyes emerge from the darkness. The artworks of The Saturday Evening Post have always had a special place in the heart of America. There is a certain nostalgia for the jolly characters that graced the cover each week. 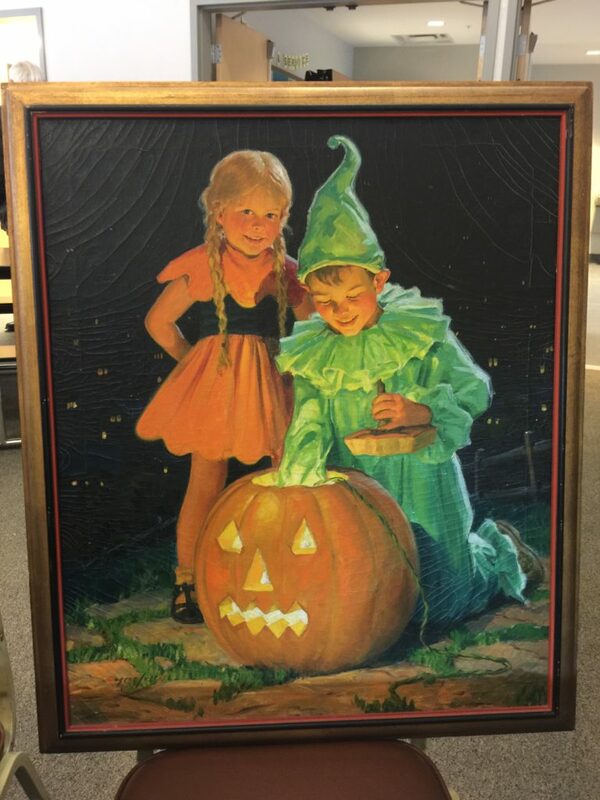 ‘Lighting the Pumpkin’ is an exquisite example that is estimated at $10,000-$20,000. To view more of Eugene Iverd’s covers of The Saturday Evening Post visit here. To stay up to date on our appraisal events follow us on Facebook.